Because I am writing a YA (Young Adult) novel that takes place in the ocean, with merpeople and magic, my wonderful Reading Angel and YA Book Goddess April has been on the lookout for undersea fiction for me. She shared a link to the 2014 animated film Song of the Sea, which was nominated for an Academy Award (and lost to Big Hero 6). Even though this movie just came out, I was able to make an interlibrary loan request (thank you, 2015, for getting me around that one-year ILL rule) — and I was blown away by the film. Song of the Sea is the most emotionally powerful, artistically exquisite animated feature I’ve seen in a long time. It’s not a tragedy like Grave of the Fireflies, but I think the same level of tears poured out of my face. Maybe more. Not in sadness, but from the force of the tale. 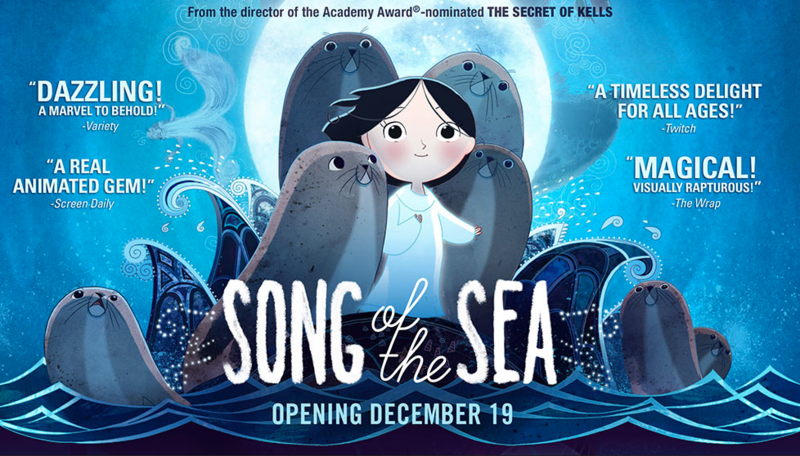 Song of the Sea is a retelling of the Celtic myth of the selkie, a mythological being (usually a female one) who lives as a human on land and as a seal underwater. This film is a masterpiece. The art, the music, and this gorgeous, gorgeous story — it took my breath away. The moment Song of the Sea ended, I went to Amazon and found a copy for $7.00, which I immediately purchased. The DVD arrived this week, and will now sit in pride of place beside my collection of Hayao Miyazaki films. I love this piece of art SO much — I want it on canvas one day in my home! One day when I have money again, when my books sell like, five thousand copies a year, and I don’t have to stress about figuring out how to come up with the coins to self-publish Mark of the Pterren — (to say nothing of paying off the mortgage on my mom’s house! Nothing grinds my gears like mortgage stress.) But anyway, in some kind of peaceful future that does not involve my mom’s mortgage, then I could figure out how to have this art in my home. 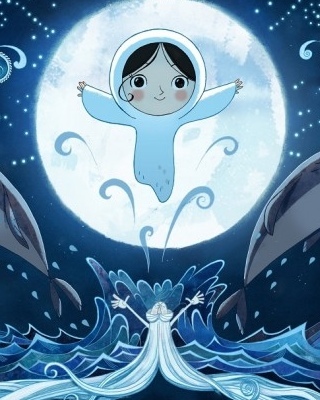 Song of the Sea is a film by the Irish illustrator, comics artist and filmmaker Tomm Moore. His first film was The Secret of Kells (2009), which I was also able to view via interlibrary loan, and can happily report that this movie is gorgeous and breathtaking and full of wowsa. That’s a picture of him with characters from The Secret of Kells. You can tell what a cutie-pie he is. Any man who can make art like Tomm Moore is just insta-hunk, no? He could look like the creature from the black lagoon and still be a total dreamboat. I’d love to be able to tell him in person how gorgeous his art is, and how much I love the stories he tells. In 2014, Moore co-directed a segment of the Salma Hayek produced film The Prophet with Ross Stewart, adapted from Kahlil Gibran’s book of prose poetry essays, The Prophet. Sometimes I fill my computer screen with this image and just feel swept away into joy. I love this art, love this art, love this art. Like that adorable mermaid with the white seal, I want to own a huge canvas of this artwork from The Prophet one day, like five feet by eight feet or something, so big I see it the moment I step into the room. Either above my bed or in an office space where I work, this art is like a primal homecoming for me, an image that is like hearing the sacred sound “Om” in a prayer. My favorite trailer for The Prophet can be found on this page — The 405, which features a few other trailers along with The Prophet. But since I couldn’t figure out how to display that trailer in my blog post, I’ve pasted the official trailer below. It’s definitely worth the watch, if you haven’t seen a video for this beautiful movie yet. Hey Melissa, i am from indonesian and just read your blog. Your blog is good and i like it. Like you, i have a passion in animation and i love Hayao Miyazaki works, especially Princess Mononoke, Castle In The Sky, Spirited Away, Ponyo etc..
And i fall in love again with this animation like Song Of The Sea, The Prophets, The little prince.. maybe we can be a friend to share this kind passion and hobby. 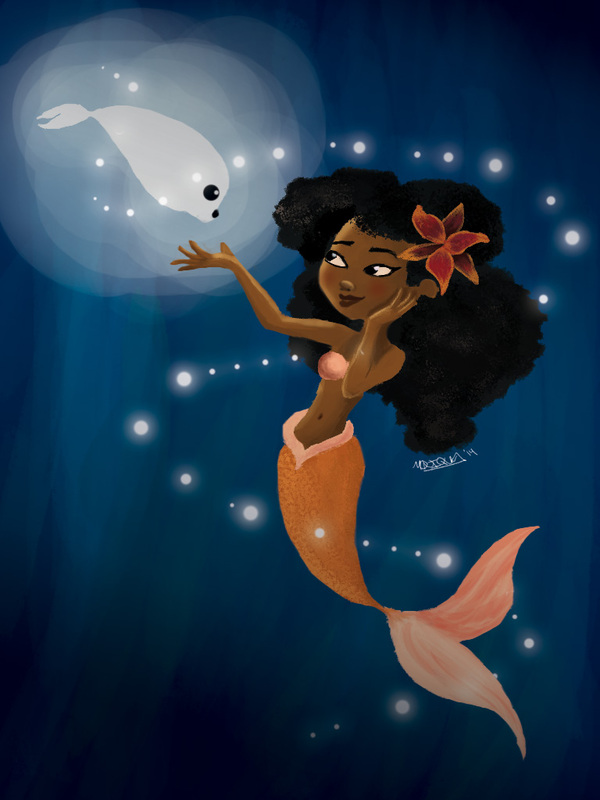 My name is Monique and I am the artist that drew the mermaid pic. I see that you would like a print to maybe decorate. Please contact me and maybe we can work something out. Thank you for sharing my work and this was a great read! I lament that Song of the Sea–and Book of Kells before it–was never shown close enough with enough notice so that I could see it. One of the first DVDs I bought was the Secret of Roan Innis, also about selkies. Sweet film, lovely music. In it, the young’uns leave Dublin and go to the West Coast of Ireland to their grandparents, because the air is healthier for growing kids. I’ve always felt that Studio G films have an adult feel to them, even when they are about children, and I got the same vibe from this guy’s movies. Lovely stuff!